The Endocrine System’s primary function is to release hormones to maintain homeostasis and regulate body functions, including metabolism, growth and development, reproduction, and behavior. The human body’s multiple endocrine glands release a variety of hormones. Different endocrine glands respond to stimuli by synthesizing, releasing, or inhibiting the release of hormones. In general, hormone release is described by a negative feedback mechanism, meaning the effects of the hormone on the physiology cause a cessation of further hormone release. Positive feedback can occur with hormone release, which leads to more hormone release as the physiologic effects of the hormone are felt. Positive feedback mechanisms are generally isolated to sexual and reproductive hormones . The Endocrine System will affect metabolic function, renal function, ion regulation, and sympathetic stimulation. The engine does not attempt to model growth, sexual, or reproductive hormones. Hormone values are initialized where necessary during reset. There are no conditions in the Endocrine System. There is no system-specific function for Preprocess in the Endocrine System. During Process, epinephrine is released. This release is augmented in response to exercise and/or stress. The rate of insulin synthesis is calculated and insulin is added to the system. There is no system specific function for Post Process in the Endocrine System. There are no assessments in the Endocrine System. Figure 1. The data flow for the Endocrine System consists of a Reset, Conditions, Preprocess, Process, Post Process, and Assessments. Only the Process function has system-specific functionality for the Endocrine System. The Endocrine System currently contains only two hormones: epinephrine and insulin. Both hormones are released endogenously and cleared at a specified rate. The release rate of insulin is modified by the concentration of glucose in the blood, and the release rate of epinephrine is perturbed from the basal rate by two actions: exercise and acute stress. 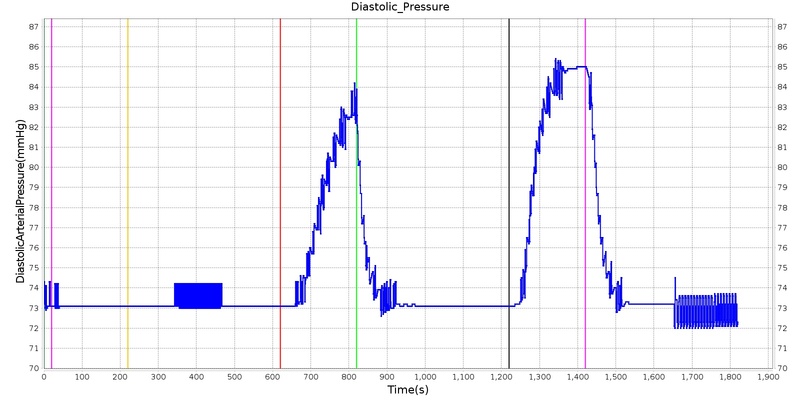 Where R is the tuned basal insulin synthesis rate in microunits per minute. C is the upper glucose concentration set-point in grams per liter. a1 is the lower glucose concentration set-point in grams per liter. The equation gives the insulin synthesis rate in microunits per minute as a function of the blood glucose concentration in grams per liter. The remaining parameters are tuning constants that were adjusted to achieve the correct insulin response. Because the Cardiovascular System does not contain a pancreas compartment, the insulin is synthesized directly in the splanchnic. It utilizes the glucose concentration in the aorta to determine the amount of insulin to be synthesized. Insulin does not have any effects attributable to pharmacodynamic model. Its only purpose is to modulate the consumption of glucose. Epinephrine is released by the adrenal medulla at a basal endogenous rate of approximately 0.18 (μg/min) . 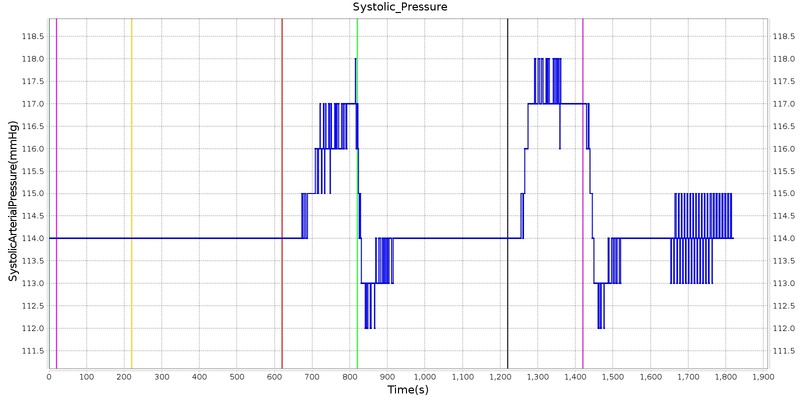 To enable patient variability, the engine uses a mass-normalized basal epinephrine release rate of about 0.003 (μg/kg-min). Because the engine does not have an adrenal gland compartment, epinephrine is released equally from the kidneys' efferent arterioles. 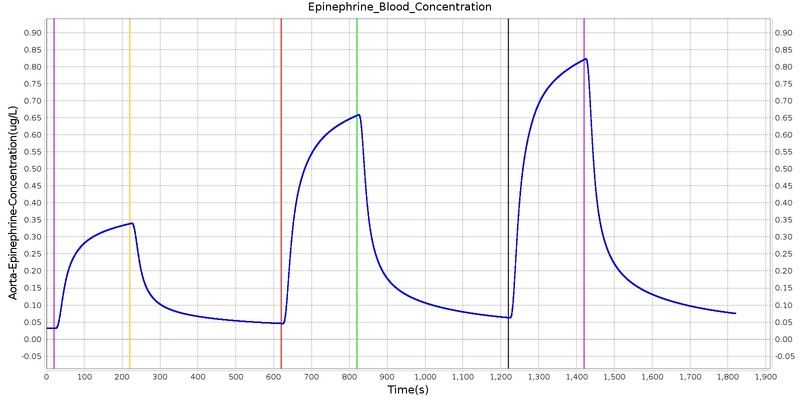 The epinephrine clearance rate is constant and will not change with concentration (note that the actual amount cleared is a function of the concentration as well as the hemodynamics). A basal clearance rate of 68.7 (mL/kg-min) was computed from the basal release rate and by assuming a steady-state normal concentration of 0.032 (μg/L) . The basal clearance rate is a property of the epinephrine substance definition; therefore, the clearance rate can be adjusted in the epinephrine substance file to achieve a desired steady-state concentration. A wide range of normal basal epinephrine concentrations are reported in literature     . Two stimuli, exercise and acute stress, can modify the epinephrine release rate. The increase in epinephrine release as a function of above-basal exercise was developed using data in  and . We assume that the epinephrine clearance rate is constant; therefore, the fractional increase in epinephrine concentration described in  and  can be assumed to be due to a similar fractional increase in release rate. Using that assumption, we fit a logistic function to the basal-normalized epinephrine steady-state concentrations during exercise presented in . The release modifier varies from 1 to 19.75, as shown in Figure 2, meaning that the epinephrine release rate will be 19.75 times the basal release rate with maximal exercise. The model is implemented by first computing the above-basal metabolic rate and then using the generic logistic function with the appropriate parameter values to compute the release rate multiplier. Figure 2. 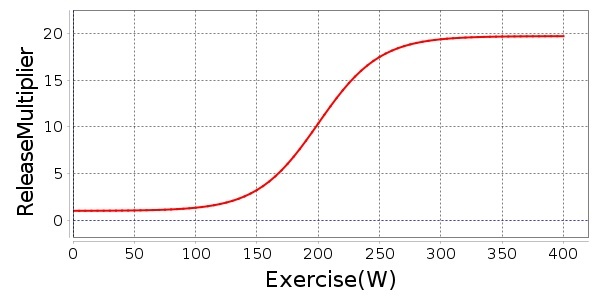 The increase in epinephrine release during exercise is computed as a fraction of the basal rate. The whole-body physiological response to exercise is compared to empirical data in the exercise validation section of the Energy Methodology report. Acute Stress is an action that causes an increase in the basal production of epinephrine. For details see the Actions section of this document. The pharmacodynamic effects of epinephrine are applied using the sigmoid 'Emax' model described in phamacodynamics section of the Drugs Methodology report. Maximum effects for the model were derived from data in , , and . Note that these researchers were examining the relationships between epinephrine and exercise, and not the relationships between epinephrine and acute stress. For that reason, the model of epinephrine release during the acute stress action is more phenomenological. The Endocrine System is dependent on the key systems of the engine. The Endocrine System is dependent on the metabolic rate determined in the Energy System. The insulin synthesis rate is dependent on the concentration of glucose in the Cardiovascular System. Epinephrine has a variety of effects in the human body, but all of the effects do not occur at the same epinephrine concentration thresholds. For example, a patient with a slowly increasing blood concentration of epinephrine would experience an elevated heart rate before they experience a decrease in diastolic pressure . The current state of the pharmacodynamic model cannot replicate this behavior, and so a threshold was chosen to minimize overall error. Furthermore, it is known that there is interplay between the blood concentration of epinephrine and that of glucose and insulin, but this interaction is not modeled. Another effect of the current pharmacodynamic model is that a higher concentration of epinephrine is needed in the blood to evoke the desired responses for an acute stress action. Additionally, the clearance rate of epinephrine is constant in the engine, whereas there is evidence that the clearance rate of epinephrine changes with blood concentration . The engine does not currently model the physiological effects of epinephrine deficiency, so a diminished blood concentration of epinephrine will have no effect. Finally, the only physiologic trigger for increased epinephrine release is exercise. Many of the insults modeled are known to cause increased concentrations of epinephrine due to pain or stress, but this release is not directly included in those insult models. Instead, a separate Acute Stress action must be specified to account for this epinephrine release. The insulin response is currently only dependent on the blood glucose level. In reality, insulin synthesis is dependent on both blood protein and blood glucose concentrations. The current dependence on just blood glucose is a reasonable assumption, because the resting synthesis rate has been accurately validated. For future releases, where meal ingestion will occur, the assumption will also hold true unless a meal consisting of protein occurs. The Acute Stress action is used to directly modify the production of epinephrine. In the human body, stress or anxiety causes a sympathetic release of epinephrine and norepinephrine from the adrenal medullae. In the engine, an Acute Stress action is rated a severity between 0 and 1, and that severity is used to modify the epinephrine release rate linearly. A severity of 0 will return the rate to the normal, basal level, while a severity of 1 will increase the release rate by a factor of 30. This model was chosen to approximate the physiological responses observed during mild pain, mental stress tests, and panic attacks   . In the engine, the hormone epinephrine is the same substance as the synthetic epinephrine available for injection. This generic epinephrine substance was validated as part of the drugs validation detailed in the Drugs Validation's Table 1. At resting physiological levels, epinephrine has no pharmacodynamic effects. The effects of epinephrine release on the physiology can be clearly seen by triggering an Acute Stress action. The patient in this scenario undergoes three bouts of Acute Stress, with the first representing mild pain, the second representing mental stress, and the third representing a panic attack. The severity levels were chosen by checking the blood concentration of epinephrine to ensure it met published values. However, a known issue with epinephrine modeling in the current engine release is that higher concentrations of epinephrine are needed to produce the effects noted in literature. In order to achieve the physiological effects, the severity was proportionally scaled up. This shortcoming is the reason for the failing epinephrine concentrations, but it allows for the other effects of epinephrine to be modeled, which has beneficial effects for other systems utilizing epinephrine. Heart rate behaves as expected, but blood pressure effects aren't always in line with expectations. This is likely an effect of baroreceptor reflex counterbalancing epinephrine effects. 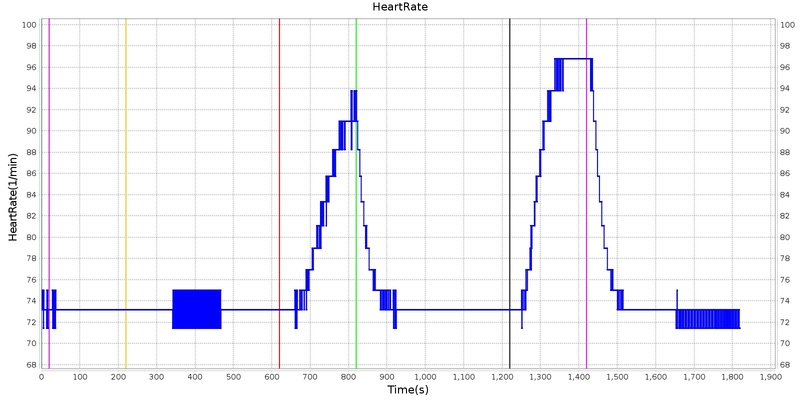 Figure 3 shows the blood concentration and select effects with the acute stress action. Figure 3. Epinephrine is released in response to Acute Stress actions. Table 1. Actions associated with the Endocrine System were validated by comparing the engine output to expected trends and data. Engine results show favorable agreement (green), some agreement (yellow), or bad agreement (red). Results mostly matched expected trends. The hormones included in the current Endocrine System provide a validated response to the effects modeled. Future work will focus on a complete endocrine response to glucose regulation including: detection of glucose levels in the blood stream and release of insulin to appropriately manage those levels. Pathology states of glucose in the patient will be included. 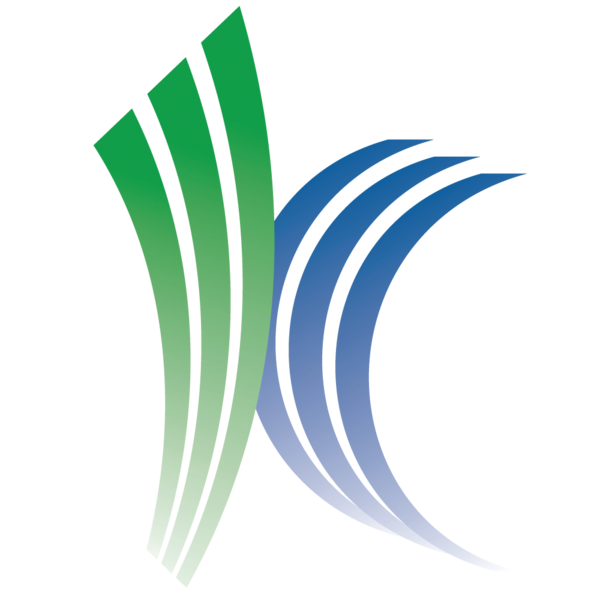 Copyright © 2017 Kitware Inc. All Rights Reserved.